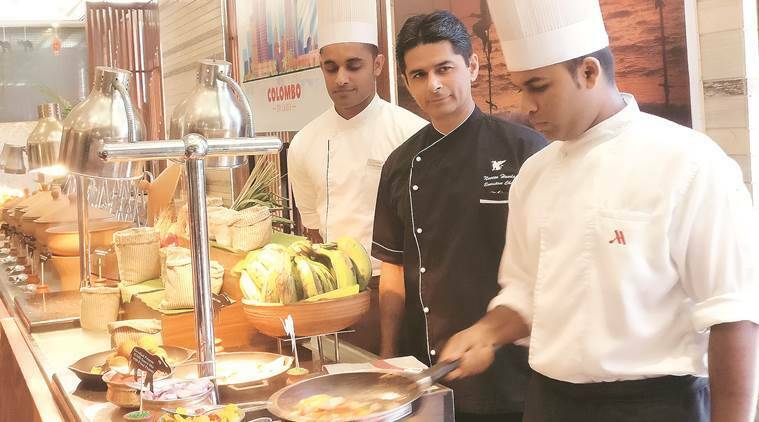 SETTING sail from the shores of Sri Lanka, chef Lakshitha Madushan and chef Hiren Madushanka from the island country are in Chandigarh to curate an authentic feast titled, ‘Sri Lankan Serenade’ at The Café@JW. “For a country with a small geographical spread, we have a lot of diversity in our cuisine. Our location made us a strategic port, which allowed Arab influence to seep in among others. Our history with the Dutch, Portuguese and the British ensured that their mark remained on our cuisine as well. For this festival, we have a wide spectrum of flavours from the Sri Lankan palate,” says Madushanka. Be it the Dutch style Chutney Roast Chicken that uses mangoes to lend the roast its sweet and sour flavours or the Portuguese influenced Pork Black Curry with the signature Portuguese combination of vinegar, mustard and onion, every delicacy offers diners an insight into Sri Lanka’s rich culinary culture. The menu boasts of a delectable mix of vegetarian and non-vegetarian dishes, with an emphasis on sea food, which is a highlight at this festival. “Sri Lanka is known for its sea food. While rice, coconut and spices are key part of our staple diet along with generous use of vegetables, we do relish some of the best sea foods in the world,” shares Madushanka. The team of chefs have brought their absolute favourites from the Sinhalese cuisine including the Dhal Curry, a tangy lentil dish made of spices, lentils and coconut milk and the exquisite Cashew and Green Pea Curry among others for vegetarians. The dishes are cooked in earthenware pots and slow cooking is combined with best quality spices that Sri Lanka is known for. The festival features delicacies like Jaffna Chicken Curry and Negambo Lagoon Crab Curry, both known for their signature Sri Lankan flavours across the globe and also traditional Sinhalese recipes of Pol Sambol and Hot Batter Garlic Cuttle-Fish. vinegar, mustard and onion are still very popular. For those with a sweet tooth, the festival is featuring traditional delicacies like Kokis, crispy Dutch-inspired cookies made from rice flour and coconut milk, and Kaju Koradiyal, a crunchy nut-filled toffee made of broken cashew nuts heated in treacle.